You must make reservations at least 5 minutes in advance of the time at Del Frisco’s Double Eagle Steak House - Plano. 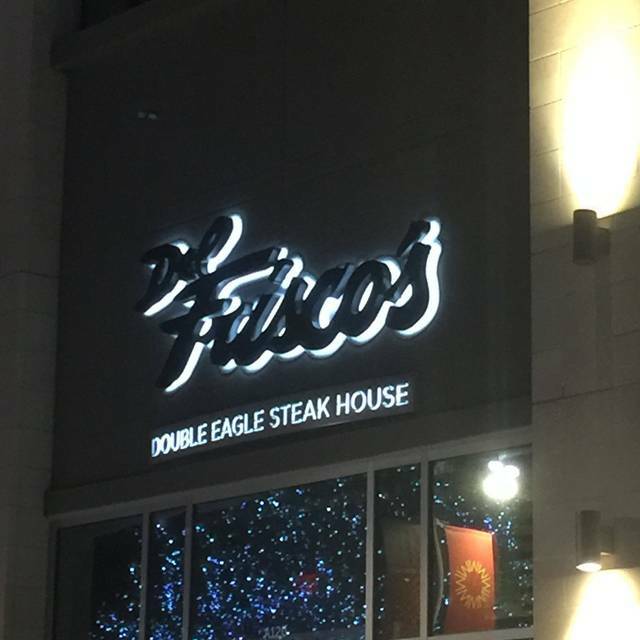 Del Frisco’s Double Eagle Steakhouse is conveniently located at the northwest corner of Legacy Drive and Dallas North Tollway in the new Legacy West development and just minutes from the Shops at Legacy. Del Frisco’s is a classic American steakhouse that serves flawless, bold cuisine and genuine hospitality. Enjoy the sleek, modern interior while indulging in fresh seafood and hand-cut steaks or take in the views of Legacy West from the restaurant’s outdoor patio. Whether you’re here on business or enjoying a special night out, Del Frisco’s in Plano is the prime location to celebrate life. Food and service were both excellent! The ambiance, the food and the service were excellent. The waiting area needs improvement. Quite small and congested. Excellent menu. Plenty of steak options. Sides and App options are diverse. Service was great. Waiter did a great job. Somm, Ariel, was fantastic. Great wine list. Ambiance upstairs was just okay. A little bright and next to the bar. Was expecting a more intimate setting. Overall fantastic food. We went for our 6th anniversary. Calimari was delish. My steak was cooked perfectly but was overly salty. Was disappointed in that. Husband got rib-eye and loved it!! Mary, our sever was fantastic!! My aunt told me a few months ago that she had never been to a fancy restaurant. After hearing this I decided I wanted to take her out for her upcoming birthday. 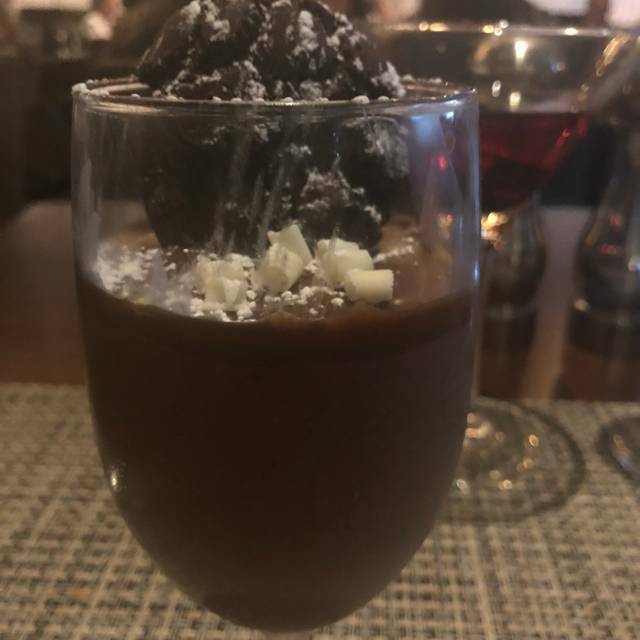 After some research and recommendations I decided to make a reservation at Double Eagle and I am so glad I did. Everything was incredible; from the service to the ambience, food and drinks. The entire staff was on point. Not a detail overlooked. Our server and assistance made sure that my aunt felt special at every turn. The Chef even came out and wished her a happy birthday! The food was perfect and the service was too notch. My aunt cannot stop talking about the wonderful night she had and it is one I will not soon forget. It was absolutely worth every penny spent and I will happily return. Thank you to everyone at Del Frisco’s for the amazing evening! This is one of our favorite restaurants. The service is what makes the experience over the top. We love it. It was excellent. We took our son and his girlfriend for prom and they loved it. The service and food were impeccable. It was an outstanding dining experience. thoroughly enjoyed our anniversary dinner and would definitely return. service was excellent! The restaurant is beautifully designed, and the food and service was impeccable. A special place to celebrate a birthday for sure! As always, great actors the board. They don’t miss much. Worth every penny. When we first arrived we were seated in the main dining room. The ambiance was wonderful but it was quite loud. We informed the manager and he was kind enough to move us to a much quieter room in back. We had a delightful dinner and the wait staff was fantastic. The food scrumptious. I loved the ambiance. Service was excellent! I would definitely recommend! Service was very slow even for an early dinner. We waited 15 mins for a server to first take a drink order. Server didn’t seem to know the menu and was unsure of what to say or do. We had to pour our own wine most of the evening as our server never came by to check on us. The food and service were 5 star. The chef was nice enough to prepare some creamed spinach for us even though it wasn't on the lunch menu. And it was fantastic! The overall experience was memorable. It was our 5 year anniversary and everyone made us feel amazing. The food was delicious and the service was impeccable. We had our 20th anniversary there. The food was excellent as the staff. Will go again. Simply amazing food, staff, and experience! Would absolutely recommend to anyone. Excellent experience! We were there to celebrate my husbands birthday. They made him feel very special and valued. The birthday desert was beyond fantastic and greatly appreciated. The experience from walking in the door until we left was top notch. 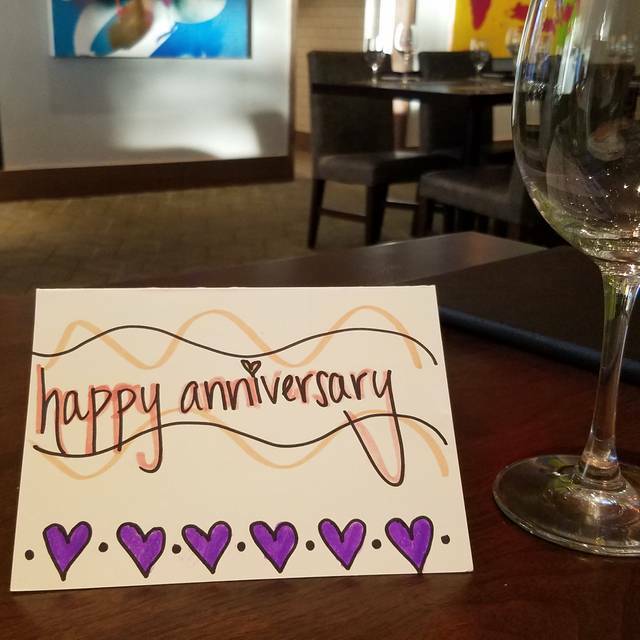 My wife and I had reservations for our anniversary dinner and almost every staff member found us at some point and addressed us by name and wished us a Happy Anniversary. The food was amazing. The setting was unbelievably nice. I did not feel like I overpaid for our dinner at all. I would gladly take my wife back here for every occasion. Drinks, appetizer, steaks, sides, dessert and coffee. Everything was very good and service to boot. Had an early evening reservation and was seated in upstairs bar which was a bit noisy but we enjoyed private conversation. Not sure how to get a dining room table. Never ceases to amaze me how wonderful their fillet is! Best place to be comfortable and eat a wonderful steak and have a great martini! Mary was amazing! Felt like she was part of our Friday night in the best way! Did a great job trying to accommodate my GF diet as far as options. It was great to have GF bread for a change. The waiter didn’t seem to interested in serving us versus other tables having alcohol But he sure was quick to give us the bill and grab the signed receipt off the table before we even up. I had to stop another waitress to refill my tea while I was choking on pepper. He probably thought yep I knew they weren’t good tippers. Well if he had actually served us we would have left a larger tip. I think in 2 hrs he maybe came to our table 5-6 times. We were only there that long because he was busy accommodating others before taking our order. I got the Filet Medallions which probably didn’t even add up to 3-4 oz 1 cooked medium rare & had grizzle, 1 Medium(like I ordered...happened to be the 1 I checked) & 1 pushing the well done stage & were less than 1/2” thick each & COLD. 3 dollops of mashed potatoes, the steak was larger than they were w/green beans. Asked if green beans could be in some seasoned butter since I had to forgo the traditional sauce due to gluten. They were not and someone else had to go get me some clarified garlic butter for them. Definitely NOT worth $38. Overall for the price & what you get I would say in the Dallas area there are other options I would pick over this in the future. We spent over $150 and it was NOT worth it. We can go to 3 Forks for less and get more food without issues or small portion size. We usually go there & never once had to send a meal back since it open yr ago. Another thing how the waiter was not listening... We specifically said Cheesecake with NOTHING on it for dessert. It came w strawberry sauce & he was gone & to get the bill. Normally I would have complained while there but at this level & price, I shouldn’t have to plus it took so long to get the meal we needed to get home to our kids. Overall the staff were friendly and accommodating except our waiter was not attentive, atmosphere was pleasant and quiet. It was everything expected of Del Frisco's. 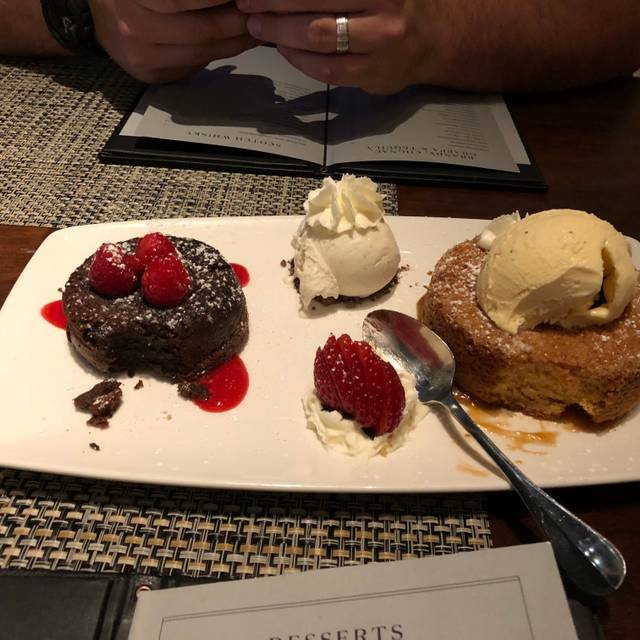 The food is fabulous and just as important the atmosphere and staff were everything that makes a Del Frisco evening worthwhile. This was our first visit to this location and we were pleasantly surprised by the layout of the dining areas and the street views from most tables. Overall a wonderful evening. The ambience is nice, service is superb, and food is spectacular! Definitely not our first visit and will not be our last. DFDE is definitely one of the best steakhouses in the DFW hands down. Waiter could have been more attentive. Water & tea glasses empty several times. We were on a mission to try as many of the top steakhouses in Dallas. My goodness.... service, ambiance, food was off the charts exceptional. One of the best meals I’ve had. All of the staff was so thoughtful, great read on what we might enjoy. The suggestions were wonderful. They made a special birthday celebration that much more memorable. Sloane was our server. She is amazing. 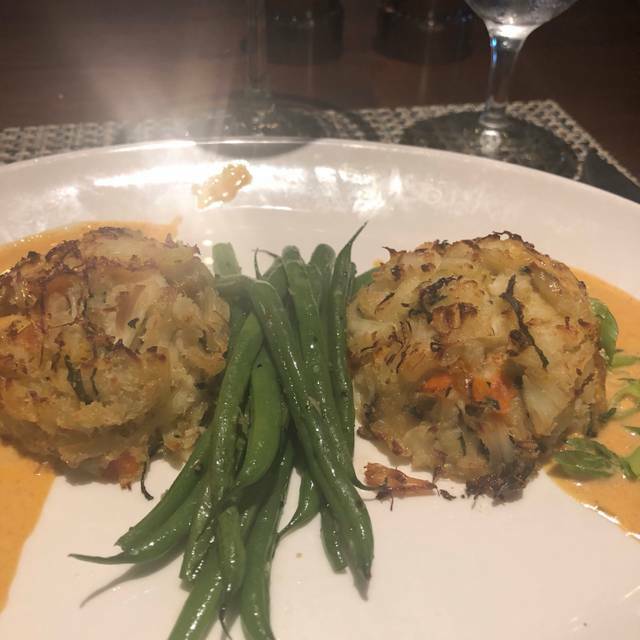 We had the Crab Cake as an appetizer. I had the Dry Aged Ribeye, my friend enjoyed the bone in filet and 3oz of the Japanese A5 Wagyu. Wow!!! Everything was exceptional. We had the creamed corn and the Potatoes Au Gratin as sides. The birthday dessert was Thai wonderful concoction of a butter cake sitting on butterscotch and topped with Butter Pecan Ice Cream along with the Chocolate Hazel Nut Crunch Bar. Wow. Just wow! We will definitely be back. Thank you for an incredible evening. Highly recommend. Great food. Nice environment for almost anything. Very friendly staff. Our steaks seemed of low quality for the price paid. Min was very rectangular like a brick and not tender. My wife had to send hers back for more cooking but then they brought it tack well done. We had the porterhouse and it was really delicious, the only thing I would change is that I want the piece of meat sliced because their knifes were not the sharpest ones. We also had the scallops and they were the best scallops I ever had in my life!!!!! 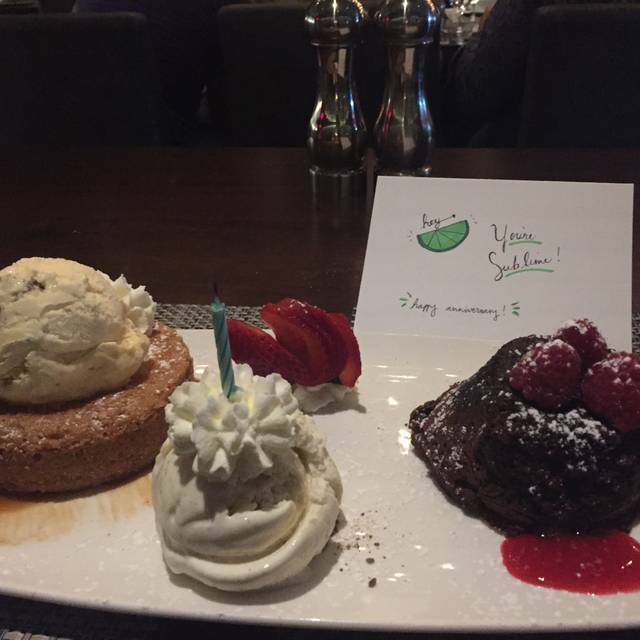 Loved that they give my boyfriend complementary dessert for his birthday. Zach, our waiter, was amazing! 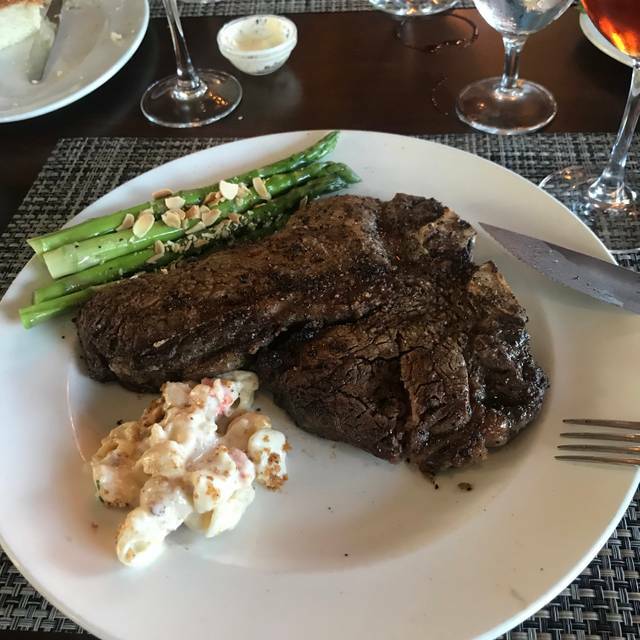 This is our favorite steak house in the DFW area and our anniversary dinner was exceptional! 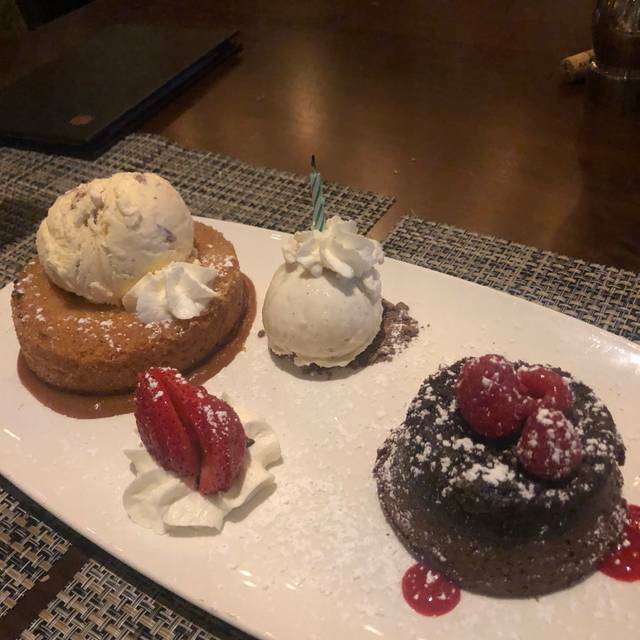 Our server, Jason, was very professional, friendly, attentive and made every effort to see that our meal felt like a special occasion from the minute we sat down. The entire staff was welcoming and very friendly. We had a very nice chat with the manager, John, when he came by our table to see how we were enjoying our meal. Chocolate mousse pie. To top it off, we were served robust/hot decaf coffee which was incredibly good. 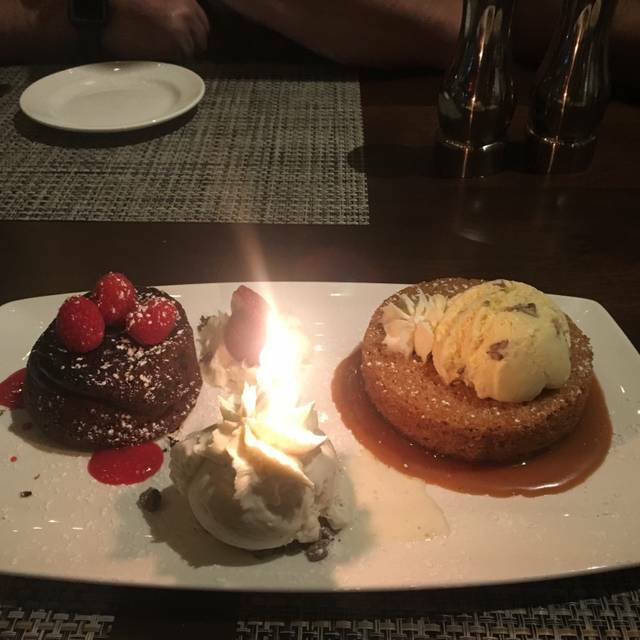 We were able to take our time eating and never felt rushed, it was a wonderful evening and we will be spending all of our special occasions at Del Frisco in legacy west, Plano! !